In the spirit of full disclosure, I feel I need to begin this review with a confession: I am an opera virgin. 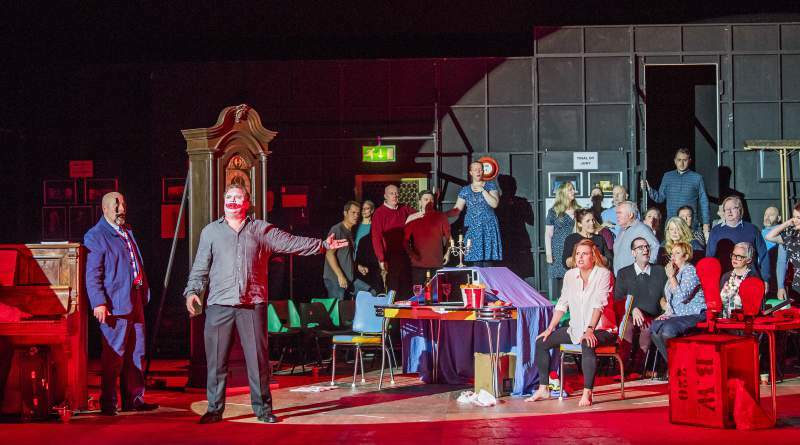 I’ve not only never seen an opera, but also know next to nothing about the form – which is precisely why I wanted to see one of the highly lauded Opera North’s Little Greats productions at Theatre Royal, in which two short operas are performed in one night. With this in mind, I’ll highlight a couple of things that surprised me: on entering the theatre, I was given a programme which offered up the synopsis of the opera – spoilers and all; being told two characters are going to cark it before I’ve even sat down was a little unusual for me. Both operas are much-loved and oft-performed classics, so some level of prior knowledge is possible although not necessary or expected (hence the spoilers). Pagliacci by Ruggero Leoncavallo and Cavalleria Rusticana by Pietro Mascagni are both considered to be classics of the Verismo style – works which depict real life in a contemporary setting. This is made explicit by Pagliacci’s opening scene, as a fella in a mac and a Sainsbo’s carrier bag enters to deliver the prologue, sung in English. This proves to be Tonio, the designer working on an opera, with an insistence that the show you’re about to see is about real people. Pagliacci is a play within a play – the company are rehearsing for a show, Commedia dell’arte; Canio directs the action, while his wife and lead actress Nedda and the rest of the boisterous cast arrive. It’s revealed that Tonio has a secret love for Nedda but, in a somewhat mocking scene where Nedda removes Tonio’s belt in a half-seductive, half-cruel fashion, she rejects his advances. We realise that Nedda is in fact having an affair with conductor Silvio, and they make a plan to run away together. Meanwhile, spurned Tonio discovers their secret and tells her husband. The next act sees a full rehearsal of Commedia dell’arte, with Nedda, Silvio and Tonio’s real-life love triangle paralleling that of the play’s storyline. Canio is playing the part of a cuckolded husband, but the pressure of his real desire to discover who his wife is having an affair with proves too much, and he breaks character to demand the name of Nedda’s lover. Silvio, watching this unfold from the piano, intervenes and Canio, wild with rage, murders his wife and her lover. The second production, Cavalleria Rusticana, is less confusing and contains fewer actors, which helps in understanding the plot somewhat. Simple sets depict three locations: Turiddu and his mother Lucia’s village shop; married couple Lola and Alfio’s house; and a church, where the highly religious Santuzza is worshipping. The action takes place on Easter Sunday, we understand through an effective and wordless introduction that Turridu and Lola are ex-lovers; spurned after Lola marries Alfio, Turridu turns to Santuzza and seduces her. We spend the rest of the production watching these three characters tussle with their emotions, as Santuzza – played by the truly magnificent Giselle Allen, whose voice is stunningly powerful – tells Lucia, and then Alfio, what the lovers are up to. Alfio – who, incidentally, owns the only taxi in the village which is pushed onto the stage and becomes the centre-piece to the unfolding drama – is wild with fury. In a moving and goosebump-inducing scene, Turiddu’s realisation of the damage his actions have done leads him to beg forgiveness from his mother. While Santuzza and Lola lie supine, waiting for the men to decide their fate, Turiddu gets into Alfio’s car and Alfio shoots him in the head. 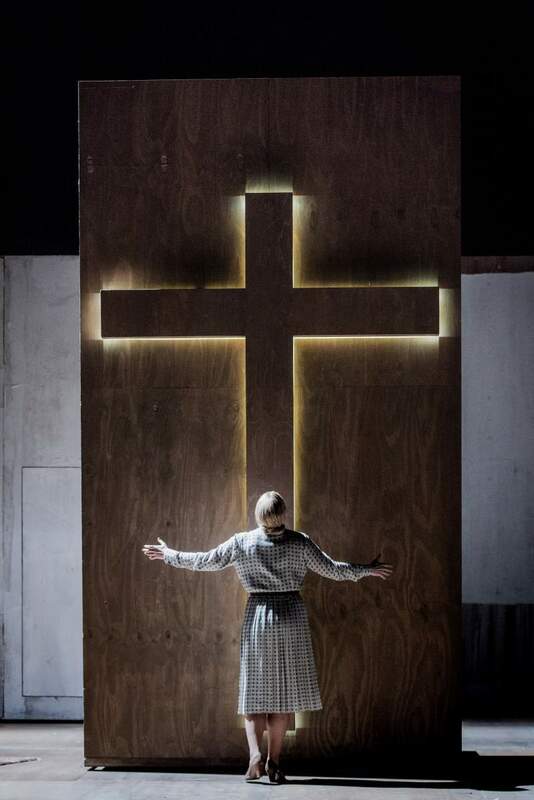 I found this performance richer in imagery – Turiddu’s God complex is made apparent as he’s hoisted against the large wooden cross placed centre stage, arms aloft; a post mirrored in his final death throws. Santuzza and Lola’s wretchedness at the hands of their men is all too apparent, and themes of religion, sin and murder are expertly played out. The skill of the cast and orchestra is second-to-none, with Peter Auty (Canio), Jonathan Stoughton (Turiddu) and Giselle Allen (Santuzza) deserving particular mention. The productions, both full of passion, have identifiable themes and it’s impossible not to get caught up in the drama. Although televisions were set up at the side of the stage displaying surtitles in English, you often feel that the subtleties of language are lost in translation somewhat, but the highly impressive orchestra’s moving score and the singing itself carries the audience to an entirely different place, where what the actors are singing is less important than the voices themselves. The Little Greats season serves as a perfect opportunity to dip a toe into the operatic pond. A further four productions are coming up in the season, which includes productions of L’enfant et les sortileges and Osud tonight (Thursday 9th), with an additional matinee show of L’enfant et les sortileges on Saturday 11th; and Trouble in Tahiti and Trial By Jury on Friday 10th, plus an additional performance of Pagliacci and Cavalleria Rusticana on Saturday 11th November.